"The first two songs we put together were 'Shivering Shivering' and 'Dallas Coulda Been A Beatdown',” adds the guitarist, “and I knew we were off to a great start." After incredible runs with the bands he co-founded – Black Star Riders and 90’s chart toppers Brother Cane – Johnson found himself in spring of 2018 in a surprising position: having just completed a coast to coast tour with BSR supporting Judas Priest, as well as select reunion performances with Thin Lizzy, he realized there were two things he couldn’t stop thinking about; his family and his music. 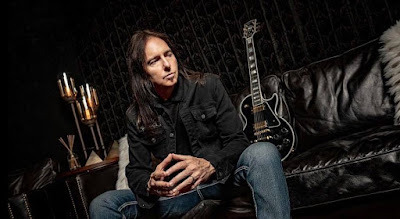 So Johnson made the decision to part ways with Black Star Riders at the end of 2018, finish his album, and start over…this time completely on his own name. Johnson is previewing “Memoirs Of An Uprising” with a sample of the first single, "Shivering Shivering", which can be heard here. The guitarist will perform a pair of shows at The Iridium in New York City on January 29 and 30; for details, visit damonjohnson.com.